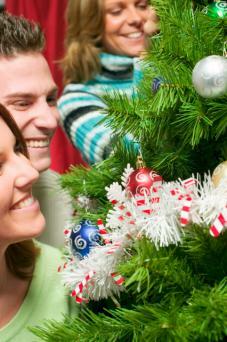 Keep your holiday exciting and fun by planning Christmas party activities to keep everyone entertained. Plan for both adults and children. Make your lists and prepare ahead of time so your party activities are seamless. 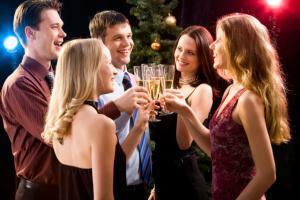 A party for just adults is a great way to unwind from the holiday stress. Christmas games for adults can be fun to play and offer plenty of laughs for all. 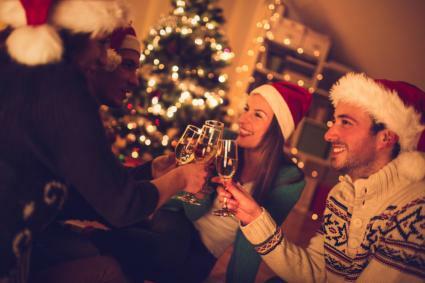 From drinking games to naughty-or-nice contests, you are sure to find plenty of ways to keep everyone amused. Hosting a hobby evening is a good way to keep mature audiences occupied at your Christmas party. You can offer a night of food, drinks, and socialization, along with the chance to work on some new skills. Provide guests with list of free Christmas scrapbook pages that they can download and print prior to party. You may wish to print traditional Christmas scrapbook pages or offer a mix of free Christmas scrapbook pages for guests to choose from. Provide a table workspace, scissors, glue, and additional embellishments like fonts and clip art. Make sure your printer is ready in case guests need additional papers or photos printed. Take photos of the party and let guests make a scrapbook page to commemorate the get-together. You and your guests can either bake sugar cookies together or you can request that guests pre-bake a dozen cookies to bring to the party. Prepare red, green, and white icing for guests to use. Provide decorative sprinkles, spatulas, decorating tubes (several for each color), and parchment or wax paper for decorated cookies. Depending on decorating techniques used, you'll need to be sure you have all the necessary equipment on hand or have guests bring their own. Teach guests how to mix various Christmas and holiday drinks. Set up your bar either using a kitchen bar area or a table with a holiday tablecloth and have Champagne set out for guests to sip while you mix. Select five to 10 drinks, depending on the number of guests who plan to attend, and assign each guest to bring a specific alcohol. You may also need to assign a couple of guests to bring blenders so you'll have enough for guests to use. Provide all mixers, utensils, glassware and ice. Before guests arrive, print each drink recipe with a festive Christmas border for every guest. Use a chalk board to write each drink in the order to be learned or print off a large menu and display on the bar with a tabletop easel. Teach friends and family how to wrap those Christmas presents to have a boutique store quality look. Watch a YouTube video to familiarize yourself with the various techniques used to create perfect corners, how to measure paper and tie ribbon. If you're ambitious, you can also learn how to create full beautiful bows. Guests can bring a couple of real gifts to practice on. Make sure gifts are in boxes for best wrapping results. Guests can also bring their own wrapping paper, ribbon, and bows to help supplement provided supplies. Provide scissors, double-sided tape and invisible tape for all guests. Host a recipe exchange, complete with potluck samples for everyone to taste. Provide each guests with a copy of the recipes used. Either compile recipes ahead of time and print in a booklet of recipe cards or save in a file and email to guests. Make your buffet festive by decorating with a bit of fresh greenery and several column candles or cover your dining table with a Christmas tablecloth, centerpiece, and candles. Consider hosting a dinner party for the fabulous adults in your life. A full course dinner party gives everyone the opportunity to shine in their holiday garb. Adults might get a kick out of a six course dinner complete with wines paired with dishes. Create an elegant table and place setting in golds, greens and reds with candlelight. Hire a catering company for the evening to serve their dishes or make your own and ask your teenager and friends to serve for the night. Prepare individual menus for your guests so they know what will be served next. Be sure to add a favor at each place setting that's in keeping with the holiday. A progressive dinner party moves from one home to another. One person will be the guide and responsible for keeping the dinner party timetable. Allow 30 minutes (or longer) for each stop, depending how many homes are participating and the style of food being served. The hosts of each home join in with the other guests as the party progresses from one house to the next. Make sure that each person understands their responsibility for their course in the dinner. Hosts will need to provide appropriate drinks. For example, each dinner party course following the cocktails portion will need a drink. The dessert party hosts may wish to serve flavored coffees as well as regular coffee. Be sure to provide both caffienated and decaffeinated. The breads, cheeses and spreads hosts will want to serve wines and offer another drink for those who don't drink wine. Bring everyone together for a party of music. For those musically adept, bring musical instruments and have a Christmas music jam session. Provide guests with Christmas sheet music and plenty of food and drink. Those who don't play an instrument can be part of the chorus. For added fun, those who don't play musical instruments, pass out percussion instruments so they can join in making music. Once the evening gets going, and if the crowd is right, you can even throw in a few dirty Christmas carols for fun. Everyone, young and old, will enjoy these festive party activities. Families participate in this age-old tradition of decorating a Christmas trim, only everyone gets to do this at each other's homes. Set up a group of families to participate. Make sure that each family has already put the lights on the tree if it doesn't have them already. That way only ornaments need to be added. Each host will offer a holiday snack and beverage, and families bring a set of cheap ornaments to put on the tree in each home. Once all the trees are decorated, take a picture of all of Santa's helpers and send one to each family. The last house in the progression will host a Christmas movie for everyone to enjoy. This is a game that's fun for families to play. Take a Santa figurine that's fairly small and hide it in a room. Have families come into the room. One person begins to move about the room and the person who hid the Santa reveals if he or she is a cup of hot chocolate or a snowflake. Hot chocolate gets hotter as the person moves closer to where the Santa is hidden. Such phrases as "melting marshmallows" can be substituted for the traditional hot, hotter, burning up phrases. Snowflake can become a "blizzard" when the person is on top of the hidden spot. Each person is timed for one minute, if they haven't discovered Santa's hiding place, it's another person's turn and continues until the Santa is located. Afterwards, everyone celebrates with hot chocolate and snowflake cookies. Be sure to take photos and videos during the game to share with everyone afterwards. It's best to play this during daylight hours. Families meet at your home to share a cup of hot chocolate or hot cider and Christmas cookies. Ahead of time, prepare a list of objects for each family to hunt. Decide on a theme with related objects to find, such as food with items like plastic forks and fast food bags, or nature with items to find like pinecones, holly leaves, and so on. Give each family a scavenger bag for placing objects. Set a time when everyone must return to your home with objects and the family with the most object collected wins a prize, such as large candy canes or a movie night gift basket you made that's filled with microwave popcorn, soda, candies and so on. Some activities that are in the true spirit of the meaning of Christmas are centered around charity. One of the best ways to teach children about the true meaning of Christmas is in helping others. Have each child select a toy (in good condition) to donate to a local Santa drive. Guests drive together to the drop-off and return to your house for a party complete with hot chocolate and Christmas cookies. Families can come together to make attractive Christmas ornaments to donate to local charity tree trimmings, such as hospices, hospitals, nursing homes, retirement centers, churches, and community centers. After participating in the tree trimming, families return to your home for a pot luck meal. Get several families together to create a food drive by collecting foodstuff for a community food pantry. Contact the person in charge of the community pantry and find out what foods are most needed. Send out emails to those on your list along with the types of foods needed. Have guests arrive at your home and each set out to collect food. Deliver to the community center and return to your home for a celebration with food and drink for all family members. Families donate $10 each to create a small budget for buying Christmas candy and small gifts. Arrange with a local hospital to visit children patients. Create small gift bags filled with Christmas candies, a coloring book, and crayons or an activity book. Dress up like elves and designate one dad to play Santa. Sing Christmas carols while delivering gifts to children. A party can be held for making the costumes and another one following the visit to the hospital to deliver your gifts. Once everyone has completed their Saturday of service, regroup at your home for an evening of Christmas movies complete with popcorn and Christmas cookies. Children are hard to keep occupied at a party. Even with plenty of friends to play with, it is helpful to have a few planned activities they will find cool to keep them out of trouble and in the holiday spirit. Look for games that help kids burn off some energy before they sit down for a meal or snacks. Christmas coloring pictures keep children busy while waiting for parents to pick them up from the party. "Duck, Duck, Goose" could become "Reindeer, Reindeer, Rudolph". "Simon Says" can be turned into "Santa Says". "Twenty Questions" can get shorter for kids with a holiday spin. Whisper a holiday word like Santa, cookie, stocking, or reindeer to the child and have the other children try to guess what it is by asking questions like "Is it red, do you put things in it, and does it fly?" Children can watch Christmas movies, such as, The Santa Clause and How the Grinch Stole Christmas. Between showings, allow kids to make s'mores while you serve hot chocolate. If you live in a snowy climate, get together with families to jointly host a party for older kids with several outdoor activities, such as as sled races, snowman-building contests, and fort building competitions with snowball fights. For contests, be sure to give out small prize awards or have each family contribute money to purchase a video game or other appropriate prizes so that each child receives a gift. If hosting by yourself, be sure to mention in the party invitation that kids bring snowsuits and boots for outdoor games. Host a Christmas karaoke contest and give ornaments for placement prizes. Play Christmas trivia games and offer Christmas candy prizes. Tell each other your funniest Christmas jokes complete with a vote and prizes. Make homemade Christmas gifts to send to loved ones who cannot attend the party. 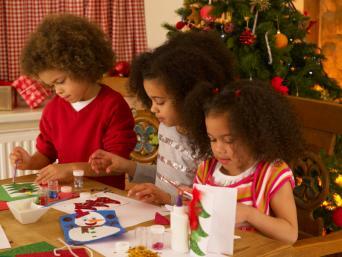 Create Christmas craft projects together, pairing a child with an adult. Put on a Christmas skit or play for everyone to watch. Host a viewing party for the Radio City Christmas Spectacular or the Disney World Christmas Parade, previously recorded if necessary. The key to having a successful party is for all guests to have fun. Put on your feet into your guests' shoes and think how you'd want to be entertained at a Christmas party and then start planning!